In Parke County, Indiana there is an annual event known as the Covered Bridge Festival that runs for a week in early October (it actually starts today, too bad it is rainy and dreary!). Parke County is famous for its 32 covered bridges, and has festivals throughout the entire county each year to celebrate their bridges. Throughout the county you’ll find some great seasonal foods and classic favorite foods such as baked potatoes, onion blossoms, barbecue chicken, sausages. The smell of the air during the festival just screams FOOD at you! Not only is food available everywhere you look at the festival, but there tents lined up at each of the festivals that are full of homemade arts and crafts. These arts and crafts range from knitted blankets to animal skins, from children’s toys to kitchen brooms, and so on and so on. You’ll even find more food under the tents – caramel apples, homemade fudge and cookies and sassafrass candy, to name a few. It was in this area that I grew up, passing my local festival on my way to school each day, the smell of the food wafting in through the windows of the school bus. On the weekend is when my mom and I would go have a look around the town square. Now, there is always the same old stuff at the festival. Nothing has changed since I used to go there during my school years. But we still liked to go (or at least I did!) for the food! One of our favorite foods was pumpkin ice cream. I’ve never found pumpkin ice cream anywhere else except at the Covered Bridge Festival. The ice cream basically tasted like pumpkin pie, but in ice cream form. I loved it! I can’t believe you can’t find pumpkin ice cream in the store, they should have it all year round! 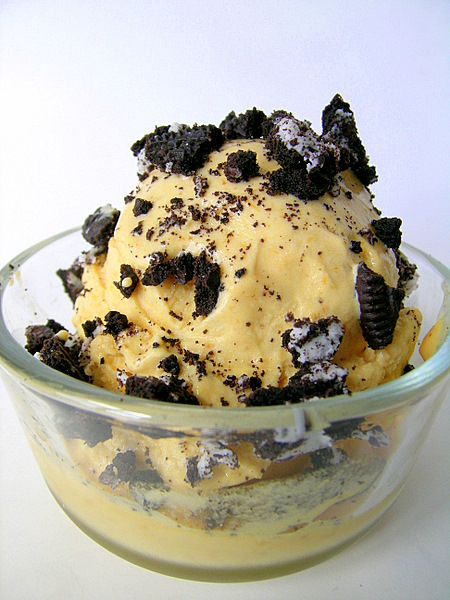 Stir into softened vanilla ice cream to create your own easy pumpkin ice cream. What!! Unbelievable, I could have had pumpkin ice cream any time of the year and didn’t even know it! I made the pumpkin ice cream almost immediately, adding the pumpkin pie mix until I could really taste it and the ice cream turned a lovely shade of light orange. Incredibly, it tasted exactly like the pumpkin ice cream from the festival. The only, and I do mean only, difference was that the festival’s pumpkin ice cream was as dark orange as the pumpkin pie mix itself. My homemade ice cream was a very light orange. This is the easiest ice cream you could ever make, and is the perfect solution for your leftover Libby’s pumpkin pie mix. If you’d like to dress it up a little bit, toss some crushed Oreos on top. This makes me realize that there should definitely be an Oreo cookie with pumpkin pie filling! I’ve also found that leftover Libby’s pumpkin pie mix is a great addition to oatmeal and pancakes. 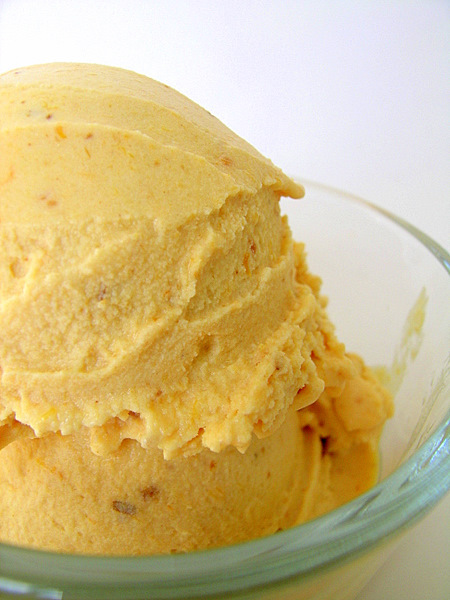 Easy semi-homemade pumpkin ice cream. Combine ice cream and pumpkin pie mix in large bowl; stir until blended. Freeze in ice-cream maker according to manufacturer’s directions. OR to make recipe in home freezer, freeze mixture for 2 hours; beat with mixer for 30 seconds. Freeze for additional 2 hours or until firm. What a fantastic idea! Back home in Rhode Island they used to serve an Indian Pudding Ice Cream at a local creamery that I imagine tasted just like this! I was obsessed, and they only made it in the fall. Thanks for the recipe! Yum! You are so clever! Come enter these on my MckLinky for Halloween treats! This looks delicious! I love Libbys Pumpkin Pie mix and already bought a few cans for the season. This looks so simple and delicious, and the oreo topping is so eye catching, makes me want to dive in! oh yum! i had pumpkin ice cream for the first time a few years back, and now i look forward to this season so i can get it at the ice cream shop! it’s great with graham cracker crumbs too!! Sounds yummy! I love the Pumpkin Pie Blizzard at Dairy Queen – bet this tastes even better!! Yum! I started mixing fresh herbs into softened ice cream over the summer to make herbal-infused desserts, so I love this idea, especially since the pumpkin flavor is only seasonal in stores and our little ice cream maker is broken! I don’t even have an ice cream maker – it’s on my want list but I just haven’t gotten to it yet! Awesome! I was just asking myself what I was going to do when my pint of Edy’s limited edition Pumpkin Ice Cream ran out…thanks for the great recipe! Edy’s sell pumpkin ice cream!? I’m going to have to look for it in the store next time! Wow! Great idea this ice cream. I’m starving here looking this beautiful pictures. Congrats. I can across your blog looking for pumpkin pie ice cream. I think I would make a pie crust to mix into it and then it would be PERFECT! You can get pumpikn ice cream at many farms, especially in Eastern PA, suburbs of Philadelphia.